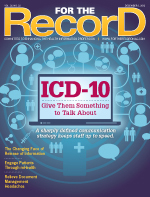 HIM departments must clear several hurdles to incorporate hard-copy documents into an EHR. Although healthcare facilities are transitioning quickly to EHRs, HIM departments must still manage volumes of paper. Documents such as handwritten notes, patient consent forms, patient instructions, advance directives, powers of attorney, and referral records present an organizational challenge that many facilities are feverishly working to overcome. Hospitals have strict policies in place as to what types of documents can be sent to an EHR. Primeau notes that many facilities scan these documents while others use tablets that enable the documents to exist electronically and allow for digital signatures. PHIC’s Nicolet Araujo recalls the mayhem that was frequently prevalent in the medical records department more than 20 years ago. “There were stacks of paper everywhere and even though the organization was scanning based, they had such a low comfort level with the process, they would scan and keep the paper, too,” she explains. As organizations move toward EHR documentation, using tools such as speech recognition and natural language processing, those paper-based forms still exist. “EHR vendors often don’t consider those documents, leaving clients to come up with solutions on their own, yet the technology already exists to correct this problem,” Araujo says. Kohn adds that physicians and healthcare workers are increasingly using digital signatures that rely on a card swipe and a password. “Even less sophisticated systems have this capability,” she says, “and they require no more training or resources at all. A document management system (DMS), which complements an EHR, can enable organizations to keep track of versions of documents as they change. For example, a DMS can monitor EHR components such as dictated physician notes that move from the original recording to the transcriptionist and back to the physician for approval. It’s important to know how a DMS is organized, whether it’s easy or difficult to locate documents, and whether the system is incorporating all documents. “Essentially, DMS is a scanning system, so you have to consider what format the documents need to be in for the system to accept them and does it take an electronic feed of what would be produced as a paper document,” Araujo says. State and federal laws mandate how the compilation of documents that comprise the patient medical record is created, who creates it, and how it is maintained. Because nothing can be destroyed or reconstructed during certain time parameters, facilities must have the ability to store multiple versions and maintain version control. While bar codes have the least margin of error, an entire analog form cannot be bar coded. Scanning is generally a better choice to ensure that staff can view specific information written on a document. However, with scanning, data cannot be retrieved from that document.